Note: Seeking shorter stays? 2-3-night stays are general found: less than 30 days out, or mid week. 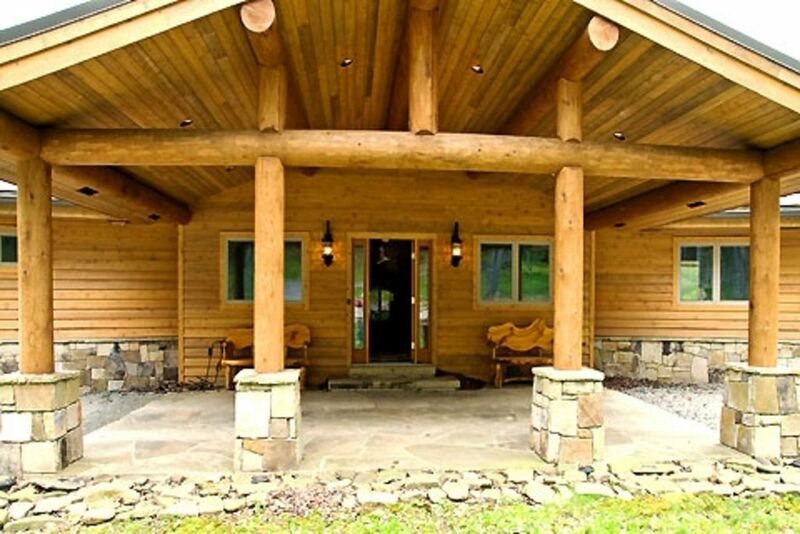 A 7-minute drive from Canaan Valley Ski Resort, Rock'n'Laurel is situated on a 5-acre lot backing to the scenic and private 400-acre conservancy within the gated community of Old Timberline. Enjoy panoramic views of alpine lakes, the mountains of Dolly Sods Wilderness and the Timberline Ski Mountain. Post and beam masterpiece with extensive custom woodwork and masonry. Ideal for 3 couples and children, this property offers an interior life so rich you may never want to go out. The house is equipped with a home theater, whole-house audio, in-floor radiant heating, lighting controls, hot tub, kayaks, yoga setup, massage table, hammock, children's toys, bikes and more. The exterior and lower level floor together were constructed of over 200 tons of local stone. The main level of the house has wide plank walnut flooring. The kitchen is outfitted with Viking, Subzero, chiseled edge granite counters and cabinets of reclaimed Douglas fir barn wood. Furnishings are all custom designer or antique from the American West. More photos and area activities at the FB page named Rock'n'Laurel! High speed internet Wifi and jacks throughout. Furnishings: The house was furnished in Santa Fe and Jackson Hole. Upholstered furniture is down stuffed and custom from makers such as Pearson, Theodore Alexander, Ralph Lauren. Master #2 features panels from an old southwestern church in the headboard and nightstands. Master #1 has hand carved and painted furniture with reliefs of basket weave and poppy blooms. In the sunroom you will find a huge antique cabinet from a nunnery kitchen in the Basque region of Spain. The dining table was custom made by Southwest Spanish Craftsmen of Santa Fe with hand carved in alder wood and adzed surfaces. The dining chairs are of rain forest woods from Peru with stretched leather panels fastened by tacks made of hammered Peruvian coins. Most mattresses are premium Sterns & Foster. There are several significant bronzes and original paintings for your enjoyment. Whole-house audio: we orient one party to its operation after arrival. There are 14 sets of Boston Acoustics audiophile speakers throughout the interior and exterior. The central system allows music via CD or your MP3/streaming music device of choice. The home theater is a 65" Sharp Ultra HD Roku TV with Yamaha Dolby 6.1 surround, reference quality Boston Acoustic speakers, REL Storm subwoofer. Play DVD's or streaming video - no cable TV. There is a RokuTV in Master #1, with 5-speaker in-wall surround sound for music or streaming TV. There is a stereo in Master #2 for connecting your mobile device, with two in-wall audiophile quality speakers. The outdoor deck and large stone patio have a total of 3 pairs of speakers with separate controls outside. I run a small software company called Apollo Matrix in DC and raise 3 kids with my wife Sienna. I am a design hack who appreciates good design in things natural and man-made. And I enjoy pretty much all mountain sports. Canaan Valley is a pristine alpine setting with exciting weather, wildlife, mountain streams, conifers, rocky landscapes, a clear sky and all the mountain sports I love. Canaan reminds me of the West. And with a new highway to Davis WV, it's only 3 hours from DC . I'll estimate that 25% of our guests in 2018 were repeat guests and that percentage is growing. This is one of the most valuable lots in Timberline for good reason. And according to more than a few, the coolest house in the Valley... Large indoor common spaces with epic views of mountains, lakes, meadow and wildlife. This is Canaan Valley experienced to the fullest. Great family hiking right from the back door -- much of it within view of the house. From the house you have a 180 degree view of safe terrain for the kids to play out back. Skiing, Dolly Sods Wilderness, fishing, canoeing and much more within minutes. shower, Located by the hot tub. Bathrooms are all built with high end Italian plumbing fixtures, stone counters, custom wood vanities, and hand painted and natural stone tile. There are no nearby large cities. The village of Canaan Valley is 2 miles. The Town of Davis, pop 600, is 10 miles. The town of Thomas, 2,000 is 13 miles. The house backs to Sand Run Lake. This lake is an alpine bog lake that is only a few feet deep and does not permit swimming, but it is beautiful and has good fishing and boating. Canoeing and fishing but no swimming. Cabin Mountain and Dolly Sods Wilderness Area comprise the view from the back of the house. Supplemental central air. Most Canaan houses do not have AC. Wifi throughout and network jacks. Upgraded to the highest DSL speed Canaan's service offers. Apple Airport allowing Airplay to whole-house audio. Monogrammed robes and plenty of spa towels. Towel heater near hot tub. Yoga mats, books and props. Professional massage table, sheets, heat pad, props. Large great room with fantastic views. Large Subzero fridge with freezer. Separate wine fridge with 2-zones. Viking gas range with griddle and 4 burners. Viking dual fuel gas range with electric convection oven. Baking needs, spices, oils and more. Extensive spice and condiments, baking ingredients, related supplies. Cookie sheets, pans, pots, crepe pan, cast iron skillet, blender, toaster, microwave. Custom made round table of adzed alder wood with massive carved octopus pedestal. Antique candelabra converted to chandelier. Placemats, steak knives, serving dishes, lazy susan, sideboard. Roku Streaming Internet free channels plus paid Netflix subscription and paid Amazon Prime. No conventional cable TV. 16-speaker Whole-Floor Audio on main floor and outside. Inwall stereo in the 2 Masters. Popular book selection plus: Collection of antique books on the American West, Civil War, Canaan Valley history, Wildlife, Camping, Hiking. Cabinet full of games. Poker chips. Chess. Monopoly, Jengo, Rumikube. Checkers. Cards. Use your Apple iPad or iPhone to connect via Airplay and play your own music 10 to 16 audiophile speakers throughout the main floor. Each Master has its own audio system. Large lawn. Boulder structure with sand base for kids to play on. Pauley Island Hammock. Cedar adirondack chairs. 2 Pelican flat water kayaks, vests, paddles. Also there are canoe paddles that can be used with 'communal' canoes found at the far end of the lake out back. Summer: we have one large adult hybrid bike, one small hybrid bike and 2 children's bike. BYO helmets. 40ft stone patio with panoramic views, large glass dining table, outdoor fireplace. At Canaan Valley Resort in Canaan Valley State Park - 10 minutes away. Not ADA accessible. However, there is a main floor bedroom for those avoiding stairs. With high end outdoor stereo speakers and outdoor shower nearby. Towel warmer just inside the door. Catering, housekeeping, on-site massage subject to availability and must be organized in advance via manager. What a gorgeous house! The photos do not do it justice. Pete was super helpful with info on things to do and easily reachable if we had any questions. The view is incredible, and the bald eagle roosting every day on the tree across the lake was a treat we all enjoyed. I even had two bald eagles fly right over the house while enjoying the hot tub in the snow! Amazing experience. Stayed with 4 adults and 6 children aging from 6-15 and all enjoyed immensely. Kids were able to sled in the yard, play games, and use the TV while we relaxed upstairs. Nearby Blackwater Falls is beautiful and we all enjoyed the free little bouldering park nearby. Also highly recommend a stroll through neighboring Thomas, WV. Sweet little town with art galleries, coffee shop/bar and antiques. Thank you! Gorgeous house with gorgeous view! Hands down, the best VRBO experience we have had. The house was very lovely, impeccably clean, and in excellent condition. It was spacious and yet managed to also feel cozy inside. Pete was very helpful from the very beginning of the rental process to the end. The view of the water and hills is lovely. Everything was very private, and it was nice to have easy access to the walking trail. The kitchen is well stocked with all the dishes and cooking gear you need, and there was a full pantry of basic staples. We definitely hope to return! The home has everything you would want and need. Well stocked and maintained. The owner Pete was excellent to work with from reservation to checkout! We would love to visit again if we get the chance. What a pleasant surprise after so many years of visiting Canaan Valley! We loved the home's location, amenities, and convenience of the VRBO reservation system. I'm confident we'll be back and, now that we know it's a great property for entertaining others, will bring friends! Golf: Nearby Canaan Valley State Park. Ski: Timberline Ski area is about 1 mile from the property, just outside the gated entrance to Old Timberline. Canaan Valley Ski area is another 5 minutes down WV32. White Grass Ski Touring Center is about 10 minutes down WV32. Yours is an ideal location for being out of the main stream but within minutes of all three ski areas. Ski them all! Max occupancy of 9 adults and up to 10 occupants total including children (excluding infants under 1 year). Discounts further limit occupancy to renter's stated max occupancy. We are serious about max occupancy. Note: No Saturday check-ins for stays of 7-9 days. Unfortunately HomeAway does not have automatic blocking.